Resisting the urge to throw my crackling at gorgeous George as the mellifluous voice intoned aural sexual persuasion during the intro to the film at the fact, thong intactus Virginia’s I mulched instead on my popcorn. This man can really charm the birds from the trees, luckily I’d prepared myself from temptation with a Velcro online thong and mansize huggies. now to the flick well with 500 people involved crowd funding style it Georges narration was akin to Michael Moore’s Fahrenheit 451 showing the hypocrisy of USA and its poodle ally Tory B liar. This time though the magic and the revelatory power of the original that was witness to war crimes and the hunt for Bin laden mythical bogeyman behind the 911 attacks. didn’t manifest itself. It never really rose above the war footage of RT TV documentaries that have become commonplace now with citizens’ media via phones and internet streaming. Various commentaries confirmed the main thesis Blair is evil a money grabber a bloody war monger and a craven supporter of US imperialism.so! principal ally George bush junior a man who could talk and chew gum at the same time. A rarity in a US president. But seriously stripped of knickers some still occupied I came under the dark satanic charm and power of the devil himself Galloway despite the big Brother episode milk slurping mankini leotard fudge packet expresso bongo by todays gross out standards Liverpool’s Pete burns that is its rather feeble and tame. The right wing press love to hate him and the left wing love to hate him the Zionist can’t stand him and the Blairites with the Chilcott inquiry due out feared him more so. The Corbyn and momentum movement as bypassed him completely pity as he could have had some input perhaps though this film is his final legacy to the war on terror and the middle east situation if Blair can be made peace envoy for the middle east then anything is possible. 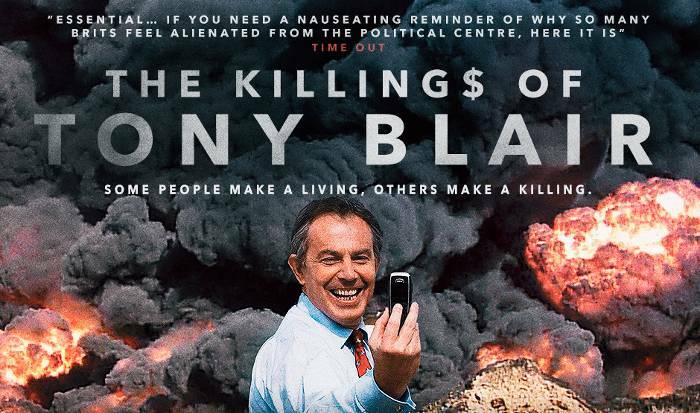 He is however and accomplished politician and perfect host for the film its content a shocking insight into the cutthroat profiteering of Blair in the war business who ignored millions on the street in 2003 to begin regime change with his buddy George. For the lesser mortals me and you it is hard hitting stuff and socially disturbing film. With US troops executing unarmed civilians brutally for fun and the notorious staged torture photos that helped usurp piers Morgan from the anti-war daily mirror he was editing at the time before he became a total cynic and celebrity obsessed moron. News can quickly become Deathporn snuff movies that circulated for years on VT old copies of VHS of Saudi Arabia beheading s to kenny Bigleys execution prisoners being tortured Isis beheading s or mass executions decapitation never looked so near.Videodrome writ large. Placing it on par with the arm twisting and bullying of the Trotskyite infiltrators of the Corbyn campaign in the momentum movement the same language trotted out by the servile press demonising the silly and trivial and distorting the truth and principles. like tom Watson voting for trident and willing to press the button against terrorist threats I but! I draw the line when it comes to coercion in the labour movement evil that must be rooted out its unBritish ? Lancet report of 600,000 deaths disputed as figures and statistics always will be a consequence of the war in Iraq we have the telling evidence of the millions of refugees fleeing the troubled lands proof some may say of the veracity of these figures. Blair’s crony’s Campbell and other blood sucker’s masters of spin and spiel distorters professional scumbags or politicians for short, had made close to £100 million since the war and successful overthrow of saddam Hussein, let alone Muhammad Gadhafi less than legal lynching by an impartial fanatic group. In conclusion the 3 killings in the title were the Iraqi war 1 million dead so far. Labour party destroyed by Blair. 100 million pound made by his PR companies. Supporting pro-western dictatorships throughout the globe his company wangles and dodges tax loophole aplenty smelling of soundbite roses. The Corbyn phenomenon maybe the antidote to the inherent corruption and social democratic rot that has plagued the country for decades.